Successfully Added Zhiyun Smooth-Q Handheld Smartphone Gimbal - 3-Axis, Built-in Battery, Light Weight, Simple Design, App Support to your Shopping Cart. Capture stunningly smooth selfies and personal videos with the Zhiyun Smooth-Q handheld smartphone gimbal. This cool smartphone accessory allows you to shoot professional-grade images of yourself and others straight of your smartphone. It makes sure that your phone always stays leveled, resulting in smooth and shock-free footage. Thanks to this, you’ll be able to film yourself while you’re walking or sitting on the back of a bike. It is compatible with phones up to 6-Inches in size, meaning it can be used with virtually any smartphone out there. The Zhiyun Smooth-Q handheld smartphone gimbal has a whoping battery that delivers up to 12 hours of usage time. Thanks to its USB input, you’ll be able to charge your smartphone gadget via a power bank while in use. Therefore, you’ll never have to worry about running out of juice during your upcoming recording sessions. With its 3-axis gimbal, this camera stabilizer offers 360-degree yaw, and 320-degrees pitch/roll. This guarantees that you’ll always enjoy the ultimate recording angles. 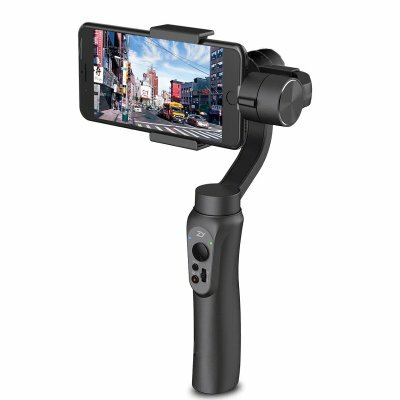 The Zhiyun Smooth-Q Handheld Smartphone Gimbal comes with a 12 months warranty, brought to you by the leader in electronic devices as well as wholesale smartphone gadgets..